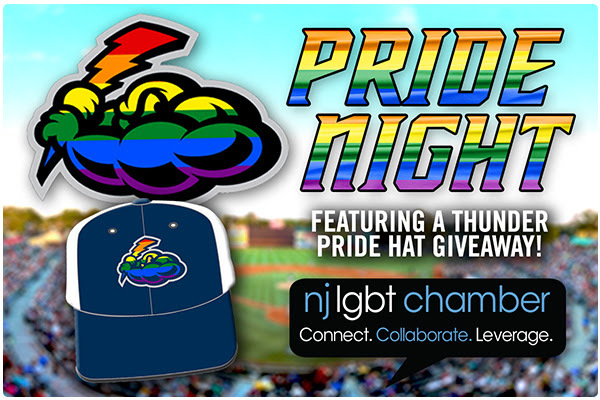 The Thunder, presented by NJM Insurance, in partnership with the New Jersey LGBT Chamber of Commerce are pleased to present their first-ever Pride Night at ARM & HAMMER Park on Monday, June 10. "We have always striven to create an inclusive environment at ARM & HAMMER Park," said Thunder GM/COO Jeff Hurley. "I look at our Pride Night as a bedrock of our continued emphasis on the fact that everyone is welcome and accepted here." The night will feature a special Pride Hat Giveaway to the first 1,000 fans, ages 14 and older, presented by the New Jersey LGBT Chamber of Commerce and a special pre-game event. "The Chamber is honored to partner with the Trenton Thunder to sponsor their very first Pride Night, and thrilled to share our message and mission with every fan," said Laurie Seliger, Chamber Board President. "Equality and visibility not only make sense ethically but also economically. In the U.S., there are 1.4 million LGBT business owners, adding $1.7 trillion to the national economy each year. Our corporate partners, BCB Community Bank, PSE&G, and TD Bank have all recognized that working with the LGBT community is an essential part of their economic growth. We are happy to be the bridge that connects and empowers NJ's LGBT and allied business community and helps them to leverage those relationships for their mutual success. The Chamber is looking forward to an enduring partnership with the Trenton Thunder Organization, and the support they give to our mission." As an Affiliate Chamber of the National LGBT Chamber of Commerce, the NJ LGBT Chamber is New Jersey's premier LGBT business organization dedicated to strengthening LGBT and allied businesses in the NJ tri-state area. It is their mission to bring together Chamber Members and Allies with resources from across the business spectrum. To learn more, visit: www.njlgbtchamber.org. The Thunder are pleased to welcome a special appearance from Billy Bean; MLB's Ambassador for Inclusion on June 10. Bean, who made public that he was gay in 1999, was named MLB's first Ambassador for Inclusion in 2014. The California native played parts of six seasons in the major leagues with the Detroit Tigers, Los Angeles Dodgers and San Diego Padres across the 1987-89 and 1993-95 campaigns. "I am extremely proud of the Trenton Thunder for making such a powerfully inclusive message to their amazing fans and community," said Bean. "A night like this is another bright example of baseball's effort to make every fan feel welcome and supported. I look forward to attending the game and meeting as many Thunder fans as possible." Organizations that are interested in participating in Pride Night, presented by the New Jersey LGBT Chamber of Commerce, may contact Group Sales and Special Events Representative Casey Borish at CBorish@TrentonThunder.com for more information.